As I’ve said again and again – Science is everywhere! It’s in the air we breathe, the body we move around in, the nature around us, and the food we eat. It’s even in the sweet treats we enjoy. Yes, Peeps science is a thing. One of our kids’ (and maybe my) favorite things to do with Peeps candy at Easter is put them in the microwave and watch them expand. If you remove them from the microwave before they explode or catch fire, (note: Remove the Peeps before this happens. This can ruin your microwave.) the puffy Peep collapses into a flattened mass of goo. If you plan on eating it, do it fast before it cools and hardens. So what makes the Peep puff up in the microwave and then collapse as it cools? Peeps are made mostly of sugar, water, and gelatin. This mixture is heated and whipped to add air bubbles. This creates the light, fluffy texture of Peeps. As this mixture cools, the gelatin and air bubbles helps the Peeps hold their shape and not flatten. When we heat a Peep in the microwave, the air molecules in the bubbles inside the Peep start moving faster. As the molecules start moving faster, the pressure inside the bubbles begins to increase and push on the walls of the bubbles. The heat of the microwave is, also, starting to cause the sugar in the Peep to soften. So, when as the air molecules push on the sides of the bubbles inside the peep, the bubbles to expand and grow. This is what causes Peeps to get bigger when heated in the microwave. My kids are always disappointed when we take the puffed up Peep from the microwave only to see it instantly deflate. Once the heating stops, the air molecules slow down and stop pushing against the wall of the bubbles and some bubbles burst letting the air out of the Peep. This, plus the fact that some of the water in the Peep evaporates during heating lead to the collapse of the Peep. One day after looking at our deflated Peeps, we talked about the changes that took place in the Peeps do to heating. We thought about the air escaping and the water evaporating and wondered if this caused a change in mass, or weight. Well, there is only one way to find out. Design an experiment! Weigh your glass bowl. If your scale has a tare feature, use it now. If not, record the weight of the bowl. Next, add a Peep to the bowl and record the weight of the Peep. If you do not have a tare feature on your scale, you will have to subtract the weight of the bowl from the weight of the bowl and the Peep to find the weight of the Peep alone. Place the Peep and the bowl in the microwave. Heat for 30 seconds. Immediately after the microwave shuts off, take the bowl and Peep out of the microwave and weigh it. Record the weight of the Peep. Again, subtract the weight of the bowl if you did not use the tare feature. Continue this procedure with new Peeps each time increasing the time by 10 seconds until you have reached 60 seconds. Each time you repeat the experiment, it is called a trial. Record the before and after weights, along with the time for each trial. When all the trials are completed. Subtract the ending weights of each trial from the beginning weights. This is the mass or weight lost in each trial. Graph the amounts of weight lost against the time each Peep was heated. What does the graph look like? Discuss and explain your results. 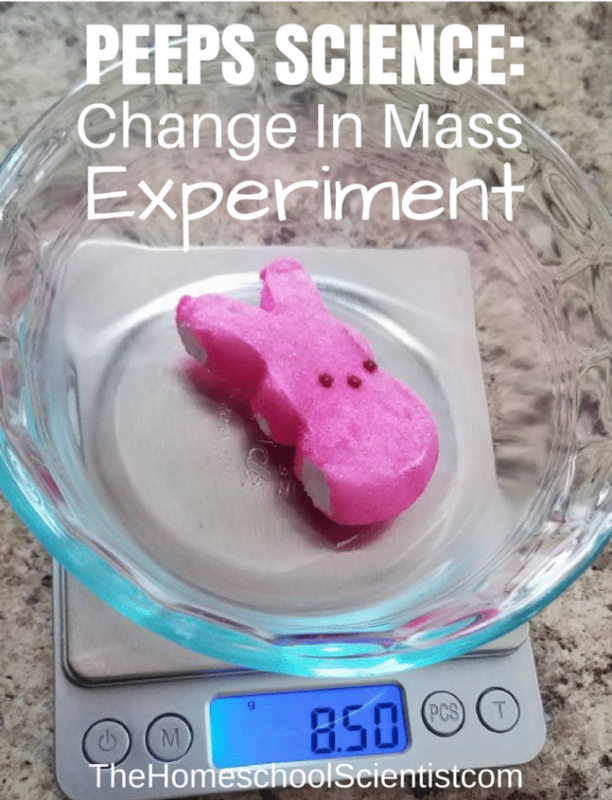 We always have way more peeps than we need to eat so this experiment will be a fun way to use up the extra peeps! Is it possible to do this in an oven? We don’t have a microwave. Thanks. That would be a great experiment – just to see if this works! Try it out and let me know how it goes.